1. 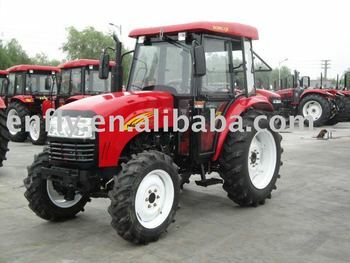 Equipped with Chinese famous "Xinchai" engine,which can have EPA, showing advanced capacity, low fuel consumption and high economic efficiency. 2. Streamlined appearance design, beautiful and generous. 3. Transmission Case adopt meshed shift and add the gearbox interlock device makes the operation more smoothly, reliable and easier. 4. Double action clutch with disc spring, perform steadily and easy to operate. 5. Fully hydraulic steering system greatly reduced drivers' work strength. 6. Wet disc brake device, reliable brake performance. 7. Seperate injection of hydraulic oil, reliable to operate. 8. The lifter with force and position adjustment, with reliable lift. 9. Double speed PTO: 540/760r/min showing high working efficiency.